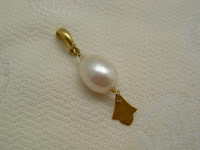 J Crew offer this "boule pearl charm" for $450 on the current online catalog. That's super-pricey! They say nothing about origin or quality of this pearl. It looks OK- round with no obvious flaws in this photo, but it's boring: no orient, the flash of iridescence that makes a pearl mysterious and compelling. The band is only 10k. At 15mm, it has size, but nothing else. Not worth it, and I'm surprised they can't offer better. My heartbeat picks up for this nearly 13mm Australian platinum white pearl with a 22k bail from respected eBay seller and designer Care Ehret, whose seller ID is druzydesigntreasures, listed at $339. You can see the difference, can't you? You can find lovely pearls at lower price points, too. 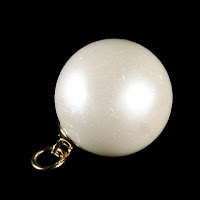 The knowledgeable, even scholarly folks at Kojima Pearl have some appealing designs; here's their Chinese freshwater pearl pendant (14mm x 9mm) with an 18k gold-plated bauble, on an 18k enhancer, for $135. Not a pendant, but you have to see this! Pearl Paradise offers specials every month. February's is a luscious 9mm to 9.5mm s trand of baroque blue Akoyas, natural and untreated, for $465. Smaller strands are listed too, but go for these, they'll delight you forever. Imagine them glowing round your neck for the about the price of that lone J (s)Crew clonk. oh, the alliteration! and the pearls are lovely as well. Yikes! Why would anyone buy a pearl from J. Crew. Whoa--they are gorgeous, but they sold out FAST!!! Did you see the Malia and Sasha Obama Commemorative necklaces? How silly! Commemorating two presidential KIDS? That are ALIVE? Did they have a special edition piece for Amy Carter or Chelsea CLinton? Bwahhh! I'll add the site to favorites. THanks! I still am saving for the sim diamond earrings! Karen: yes, they do as they are exceptional deals. If you wish, contact the nice people at Pearl Paradise to alert you when they get more. When you point out the difference I can really see the extreme contrast in quality. My pearl ownership extends to a single black pearl and a pair of earrings, but thanks to you I think I may be expanding that range. That last strand is beautiful. As always, thanks for the inspiration. And for that great site.